Punk rock and heavy metal were two genres that evolved over the ‘70s, but seemed to run parallel to each other, despite sharing common fashion, sounds, and attitudes. But then there are moments in history, where everybody plays together in the same sandbox. For example, the above audio, which captures the Australian band AC/DC on their first American tour, playing New York’s CBGB, synonymous now with punk and new wave music. 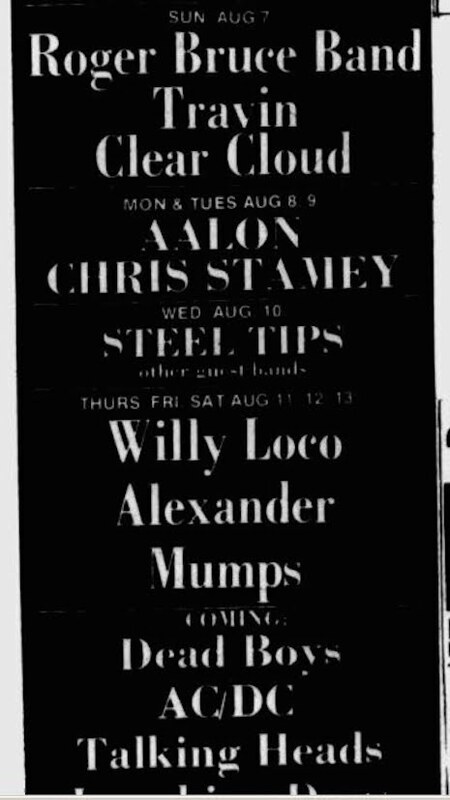 The date is August 24, 1977, and AC/DC were on a cross-country trip that had taken in both club dates and arenas, where they supported—yes, hard to believe, I know—REO Speedwagon. Their album Let There Be Rock had just dropped in June. The band would be in the States until the winter. This CBGB gig finds them on the same bill as Talking Heads and the Dead Boys, according to a poster from the time. And while there’s no video for this show, there are plenty of tasty photos over at Dangerous Minds, showing lead singer Bon Scott working the crowd and Angus Young—at the spritely age of 22—being carried through the crowd on the shoulders of Scott himself. You can feel the muggy New York summer in these photos, but also the excitement of an unforgettable gig. At 15 minutes, the set is short, but still three minutes longer than the Ramones’ first set at the same club three years earlier. That’s pretty metal, man. I must admit I have never considered AC/DC to be metal. They played good old-fashioned hard rock without the Deep power chords of Black Sabbath or the Glitter of Judas Priest. When AC/DC arrived in Seattle it was played alongside Jimi Hendrix not the Metal types. Still it is nice to hear it again. AC/DC wasn’t metal, they were just that good. AC/DC has never been considered a metal band. But! Thanks for uncovering this recording. I ended up here via today’s CBGB post. Not to be pedantic, but the poster you refer doesn’t say the bill included Talking Heads & the Dead Boys. All 3 bands are listing under the “Coming” section – no date or bill for this night is specified. Imagine seeing AC/DC at CBGB? Wow!